TFD » Blog » Posts tagged "spring wedding flowers in season"
So many beautiful spring weddings this season, with gorgeous floral decorations that we love and just have to share with you. The spring season is one of renewal, of rebirth, and of reawakening after the winter has past. Spring is also a breath of fresh air, before the heat and hubbub of the summer. And of course Spring means, too, that love is in the air—so we are all too happy at Todich Floral Design to help you make your wedding that much more magical. Here we have gathered a quick list of 4 of the finest top wedding event decorations, ideas for you to make your wedding day truly spectacular. Whether you choose a fishbowl flower arrangements or decide to float your wedding flowers in rounded cocktail classes, single blossoms in water are a beautiful, elegant and symbolic way for you to decorate on your wedding day. They make perfect floral centrepieces and can accentuate either side of the aisle as the bride walks to meet her groom. Also consider floating candles for evening wedding receptions. Select from daisies, marigolds, lilies and roses petals among other springtime flowers. Add a diverse, bright array of flowers in the shape of your initials, you and your partner’s letters in a floral arrangement next to each other. After the beautiful ceremony, let your guests know that they have arrived to the right place by placing your surname initial or both your initials side by side at the entrance to the wedding venue. 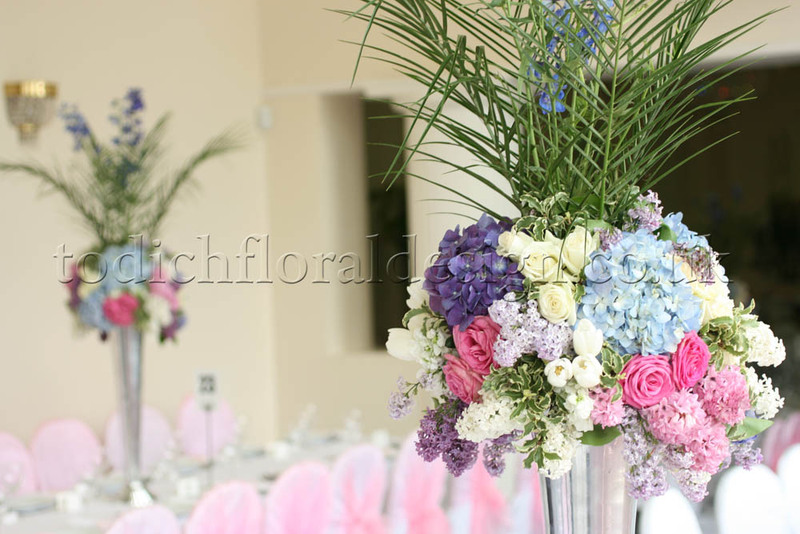 This fun, colourful piece of wedding decor is a great way to greet guests. Very few flowers say spring like Baby’s Breath—ethereal, light and whimsical as the breeze that blows through the air on a gorgeously refreshing spring day, and your wedding day! You can include Baby’s Breath in your wedding decorations in a number of ways. In silver buckets, they can serve as chair or pew decorations and table decorations at outdoor rustic weddings. You might create flower arrangements in clear glass water jugs or pair them with blush and white roses in simple yet refined floral arrangements. 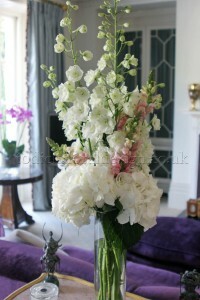 Add a touch of the fey and truly magical adornments to your wedding flower decorations and table centrepieces. Candlelight, glass, glitter and sparkling adornments help to create an otherworldly, romantic and mood-lit ambiance, perfect for spring weddings, evening receptions, and garden or rustic themed weddings. If you want purple wedding flower decorations, try a tall glass candle holder with a purple flower and honeysuckle arrangement. Fill the glass with water and float a tiny tea light on the water’s surface. 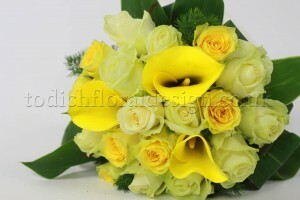 Glamorous, alluring and aromatic! A similar flower-in-water effect can be achieved by placing a shorter-stemmed flower—a blush rose, red rose, yellow or white tulip, or gardenia blossom—inside a tall and narrow glass, then also float the tea light along the top of the water. 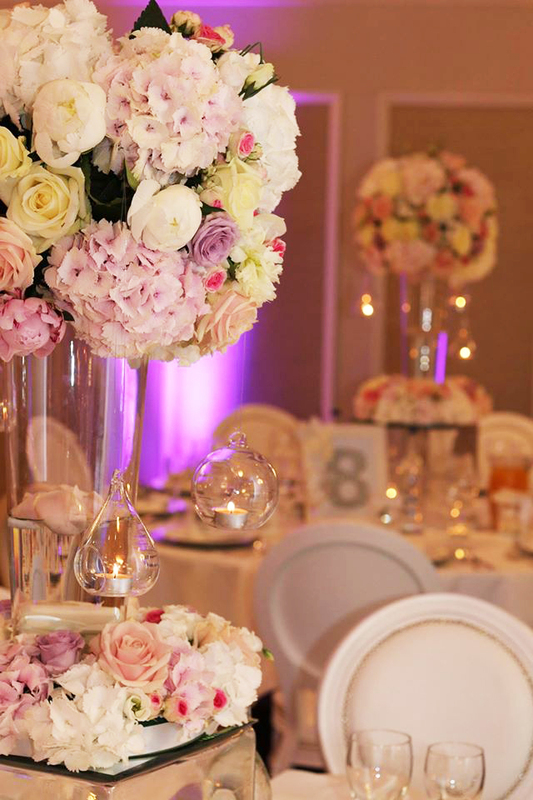 This beautiful table arrangement will captivate and delight guests.